One of the most popular touristic states of all, Florida is home to world class attractions and breathtaking beaches, with cities like Orlando and Miami attracting incredible numbers of tourists each and every year. One of the Sunshine State's relative 'hidden gems' is the city of Naples. Located on the Gulf coast side of the state in Collier County, Naples is a beautiful coastal city. Filled with tall trees and luxury residences, the city is a prime resort spot for the rich and famous, with several celebrities even having holiday homes in the area and Naples standing out as having the second highest proportion of millionaires per capita of any city in the United States. The city is home to a little over 21,000 people but attracts many visitors each year due to its high quality dining establishments, upscale shopping areas, and stunning beaches. One of the most popular areas in all of Naples is the Naples Pier; fishermen, residents, and travelers from all around the world tend to gather on this long pier each and every night to watch the sun go down. Other popular areas include Lowdermilk Park and Delnor Wiggins Pass State Park. If you're planning a trip to Naples, there are several great RV parks and campgrounds to be found in and around the city to accommodate you during your stay. Offering quick and easy access to the beautiful beaches of this Florida coastal city, the best RV parks of Naples are fitted with spacious RV sites and lots of useful amenities. Read on for more details. Located in a central position, just a short drive or walk from many of the best landmarks and locations all around Naples, Rock Creek RV Resort is one of the top rated RV parks in the city. It's also the closest RV park to Downtown Naples, so if you really care about location and want to be within just a few miles of the beaches, the botanical gardens, the pier, and Naples Zoo, this is the place to be. This is also one of the biggest RV parks in the Naples area, featuring more than 230 individually full hook-up sites to cater to motorhomes of all sizes. All of the RV sites at Rock Creek RV Resort come fitted with private picnic tables and patio areas, as well as full hook-up utilities, cable TV channels, and speedy wireless internet access. This 55+ RV park and community is a family owned and operated location with a long list of amenities and activities like coin operated laundry machines, a swimming pool, a huge clubhouse, a tiki hut, a gazebo, restrooms, showers, special lunches, dinners, dances, and more. There’s always something fun and exciting to look forward to at Rock Creek RV Resort, giving you plenty of fun ways to spend your time and forge new friendships. Located up in the northeastern part of the city, Crystal Lake RV Resort has received plenty of great reviews from past guests to establish itself as one of the most popular RV parks in the city. Ranked as one of the top 30 RV resorts in all of North America by leading travel experts, Crystal Lake RV Resort really stands out for the beauty of its location and the cleanliness of its facilities. This is a wonderfully landscaped and laid out site, with a lot of useful amenities and tropical trees to be admired. As the name suggests, Crystal Lake RV Resort is right on the banks of a shimmering lake, perfect for relaxation and recreation at any time of day. On-site amenities and facilities at this Naples RV park include not one, but two heated swimming pools and a trio of hot tubs, two huge clubhouses, lots of different sports courts for games like shuffleboard, tennis, and bocce ball, a library, a laundry area with coin operated machines, high speed Wi-Fi, and three nine hole putting greens. Situated in the southern part of the city, Silver Lakes RV Resort & Golf Club offers something a little different to many of the other RV parks in Naples. As the name indicates, this RV park also doubles up as a golf resort, and is actually the only RV park in the area to also feature golf resort facilities. It's located in one of the prettiest parts of Naples, offering breathtaking views in every direction, multiple lakes to be admired, and quick access to the city's best beaches and restaurants. Silver Lakes RV Resort & Golf Club is also one of the biggest RV parks in Naples; it stretches out over more than 100 acres of land and features an incredible total of 560 RV sites, so you'll never have to worry about finding a space. 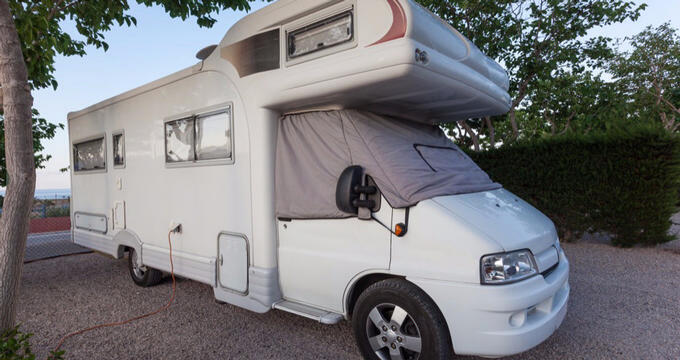 All of the RV spaces at this RV park come equipped with concrete pads, 30/50 amp power, water, sewer, and cable TV, with the option to add a telephone line too. On-site amenities at this Naples RV park include two lakes, direct access to the 9-hole golf course, communal kitchens, a library, clean restrooms, multiple swimming pools and hot tubs, a fitness center, large halls for parties and events, and more.